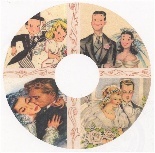 The Wedding images on this CD are from many different scrapbooks. 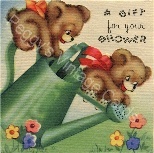 This CD contains Engagement- 3 cards, Shower - 57 cards, Wedding - 57 cards and Anniversary - 55 cards. 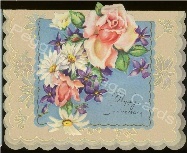 This CD contains scans of 170 vintage cards with 350+ graphic images and a combined total of 428 images and sentiments. 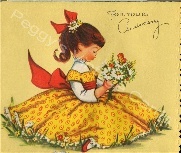 The cards on this CD date from the 1940s to the early 1950s.